11gR2 clusterware voting disk files can be stored in ASM through the ASM diskgroup. To ensure the high availability of the clusterware, it is highly recommended to store multiple voting disk files. When storing the voting disk files in ASM, the redundancy setting of the ASM diskgroup determines the number of voting disk files. The following settings are recommended for planning the proper configuration of ASM diskgroup that is used to store the voting disk files. External Redundancy: The ASM diskgroup only needs one failure group without mirroring and it only stores one voting disk file. 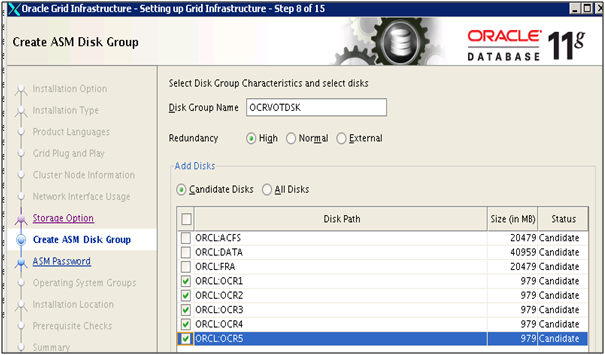 It is recommended that the disk have external redundancy RAID configuration to provide the storage high availability. Normal Redundancy: The ASM diskgroup requires three failure groups and it will provide three voting disks files. High Redundancy: The ASM diskgroup requires five failure groups and it has five voting disk files. 4. After the Grid Infrastructure installation completes, login to the ASM instance to check the ASM diskgroup redundancy setting and list the voting disk files using the command of ‘crsctl query css votedisk’.